As a reminder, the Multicultural Center and International Student Affairs office has a student lounge that is open 8:30 a.m. to 4:30 p.m. Monday through Friday as a space where students can gather, de-stress, study, hang out, whatever they like. The lounge is in the MCISA building at 536 Garden Avenue, right next to the Bookstore. MCISA regularly schedules programs that foster diversity of expression and provide a public forum/safe space in the struggle against exclusion and discrimination. The next event is The Free Hugs Project on Tuesday, Nov. 15. In this fun, creative and interactive program, peace activist Ken Nwadike brings his “Free Hugs Project” to engage students in conversations of understanding, and compassion amidst the rising tide of hatred and racism. Nwadike will interact with students throughout the day, using props, small group discussions, and hugs to transform the campus atmosphere with his loving presence. The event concludes with a keynote address at 5:30 p.m. in Winifred Moore Auditorium that will explore how to overcome the differences that divide us. The goal of this program is to create unity and build community on our campus and remind students that we are all humans in need of love. 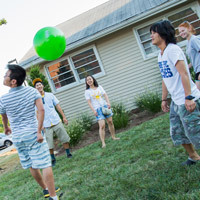 The MCISA is also where international students on the Webster Groves campus receive orientation and guidance as they begin at Webster. As part of its other offerings to students, the MCISA also offers both professional and developmental services that are tailored to meet individual needs, such as workshops, advising, student leadership opportunities and tax assistance.